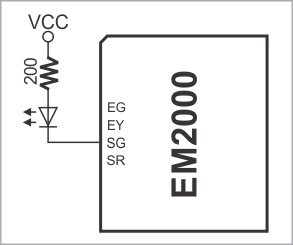 The EM2000 has four LED control lines -- SG, SR, EG, and EY. All lines have the same internal structure and the LEDs should be connected to these lines as shown on the schematic diagram below. Maximum load for each line is 20mA. Note that the EM2000 also features three onboard LEDs: green and red status LEDs, plus one yellow Ethernet link LED.